On Wednesday the Chancellor did the expected in dropping a ‘surprise’ into his Budget. But few people expected he would announce a tax on sugary drinks, to be introduced in 2018. It also diverted immediate attention from less impressive announcements, such as the downgrade in forecasted economic growth over the next five years. The surprise came from David Cameron’s insistence barely two months ago that a sugar tax would be an absolute last resort. 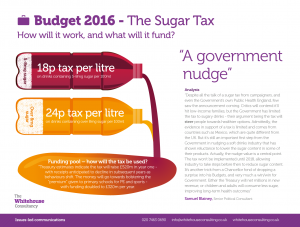 Consequently, it was expected any sugary drinks tax might be proposed when Government launched its childhood obesity strategy this summer, when it was anticipated a tax would be a default option if industry failed to reduce sugar content in its products. This move is undoubtedly a welcome one – if it indeed signals a symbolic acknowledgment by the Government of the seriousness and urgent need to take steps to tackle childhood obesity. But in order to address the problem – just under a fifth of children aged 11 were obese in 2013/4 – what is needed is more than a symbolic gesture. Hopefully the Government’s forthcoming childhood obesity strategy will set out a suite of actions that will help to address the issue in a long-lasting manner. But the measure may not be as effective in practice as expected – and not just because the evidence base for the success of this policy is thin. As with all policies, the devil is in the detail. It’s interesting the percentage of tax to be applied for each of the proposed levy bands have yet to be specified. As set out in the Government’s ‘Policy Costings’ document, uncertainties remain over the amount of projected income based on the size of the tax base that will eventually be applied. 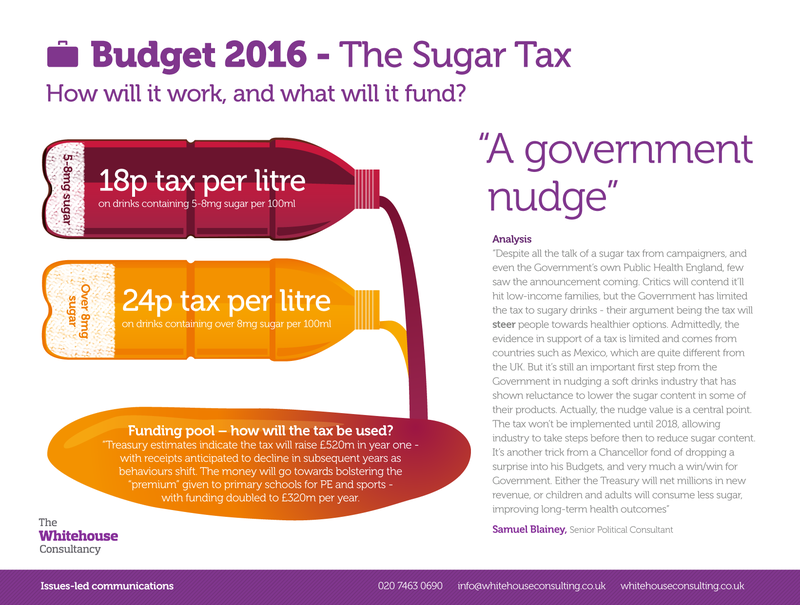 As shown in our infographic, the Government is currently advocating levels of 18p per litre on drinks containing 5-8mg sugar per 100ml and 24p per litre on drinks containing over 8mg sugar per 100ml. The question is whether these will be sustained in the face of fierce arguments from industry. If their efforts do lower the tax threshholds, it would dilute the tax’s impact as a mechanism for behaviour change. Consequently the levy would fail to influence consumer habits, while also not raising the £520 million projected. But even if the tax doesn’t raise the expected revenue, it doesn’t mean the Government will automatically backtrack on its pledge to invest more in physical education in primary schools. The Government is doubling its spending on the schools premium from 2017 – a full twelve months in advance of the implementation of the levy – so the spending commitment would be delivered. Pre-emptively spending the receipt from a hypothetical tax could, however, result in a budgetary black hole that raises broader questions about the Government’s approach toward funding prospective policies. Perhaps more surprising from Wednesday’s Budget though was an indirect undermining by the Chancellor of the Government’s commitment to pursuing a preventative agenda in the sphere of child public health. The announcement of a doubling in small business rate relief, in itself a positive and very welcome measure, could potentially have wider and negative consequences for local government funding. In the Autumn Statement four months ago, the Chancellor announced plans to allow councils to retain the revenue they raise from business rates – which would be reduced by yesterday’s announced increase in small business rate relief. This, coupled with plans to consult later this year on the possible funding of local authorities’ public health spending from retained business rates receipts – and the move several months ago of funding for public health services for children aged 0–5 from the ring-fenced NHS budget to local authorities – raises the potential that local authorities won’t have the funds to invest in preventative measures to tackle the wider determinants of childhood obesity. Whether by accident or design, it seems that the Government may well end up failing to practice what it preaches when it comes to tackling to childhood obesity – another surprise, albeit a more unwelcome one, from a Chancellor fond of surprises. To view our analysis of the Chancellor’s announcement, please click here or see below.